I'm sitting here and thinking of the perfect way to start this story, but all that comes to mind is the sound of two distinct V8 engines at high revs howling away in a tunnel. I'm sorry, but those sounds have been resonating in my head all day, and it's far too distracting. Perhaps it's my fault for revving the nuts off of them in every tunnel, but I couldn't help myself. I'm just a weak-willed petrol head. Besides, it's not every day that you get to see a BMW X5 M and Range Rover SVR, let alone drive them. 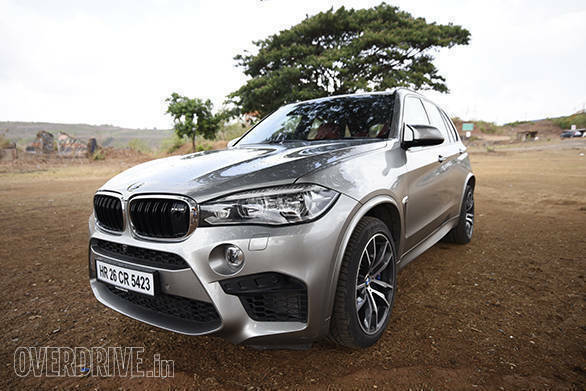 It started with the BMW X5 M. I picked it up quite early and carefully trundled along to the Mumbai-Pune Expressway  the only place safe enough to see what this car is really capable of. And let me assure you of this, the BMW X5 M  as I found out  is capable of a heck of a lot. 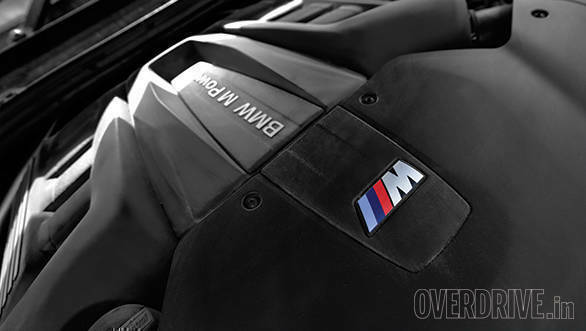 The Beemer runs a 4.4-litre V8 engine with two twin-scroll turbochargers and puts out 575PS between 6,000-6,500rpm and 750Nm of torque right from 2,200-5,000rpm. Sure, it might weigh a bit shy of 2,300kg, but don't let that fool you. 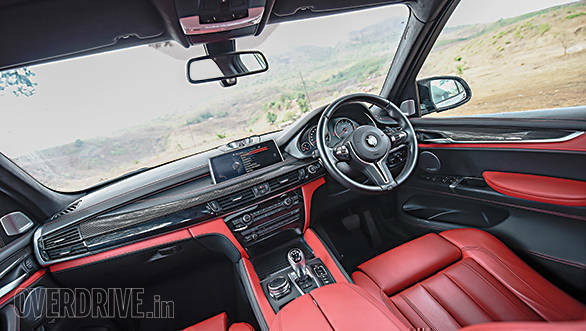 With its quick 8-speed automatic gearbox and an all-wheel drive system, the X5 M will do 0-100kmph in just 4.4s without even enabling launch control! That, my friend, is even quicker than the M5's sprint time of 4.87s! Now you'd probably say that all of this in an SUV might be quite a handful. Then, you'd be wrong. Oddly enough, for something of this stature, it drives just like a sportscar, but on stilts. It picks up and holds speed effortlessly and dives in and out of corners with no drama at all. Even the exhaust note, with its sharp and crisp tone, is that of a thoroughbred sportscar. Step on the gas and you're thrown back violently into your Merino leather-wrapped sports seat, while the engine bellows angrily and the numbers on the HUD unit change too quickly to make sense. The next thing you know, you're doing over 170kmph with a big wide grin on your face. Of course, once is not enough. So you do it over and over again until you run out of fuel and are forced to stop and tank up. Then you do it some more. When you finally feel like you've burned a big enough hole in your wallet, you start to relax and notice the other nice bits of the X5 M, like its interior. It has a very elegant dash with a plethora of buttons and a crisp infotainment display which is integrated to the iDrive system. Although the basic layout is similar to other Beemers, there are details such as the carbon-fibre trims, the M badge on the steering wheel, gear lever and instrument cluster which remind you that you're in something special. As I sat by the side of the road smiling to myself and thinking about how I might have been in love, I saw a big blue vehicle approaching quickly with a loud roar following it. It was Halley in the Range Rover SVR. He pulled up next to me with a big smile on his face. "It's just too addictive!" he said. "So is this", I replied, pointing at the Beemer. We quickly swapped and immediately I noticed that the interior of the SVR feels a notch more premium than the X5 M. The tan and black leather combination looks more elegant while the comparatively minimalistic dashboard with fewer buttons makes the BMW's set-up feel a bit too crowded. However, the slow touchscreen infotainment system is quite the eyesore, especially compared to the Beemer's display. I personally even prefer the BMW's analogue and part-digital instrument cluster over the SVR's full digital unit, simply because it looks and feels more old-school. But enough of all that, let's get on to the most important detail - the 5.0-litre supercharged V8. 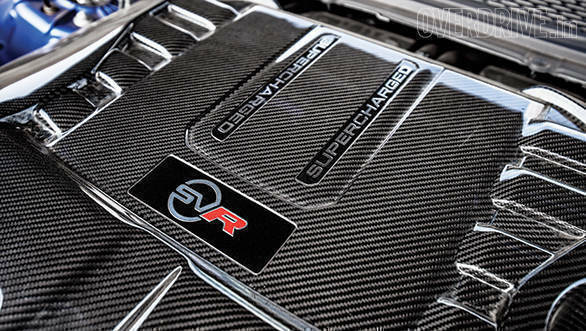 Although this engine is the larger of the two, it puts out a marginally lower 550PS of power from 6,000-6,500rpm and 680Nm of torque between 2,500-5,500rpm. It also gets an 8-speed automatic and all-wheel drive, which hurls this mammoth from 0-100kmph in five seconds! And what a racket it makes while at it! Unlike the X5 M's V8, this one reminds you of a wild, ludicrous muscle car that will have you giggling like a schoolgirl every time it crackles and pops. But that's not it. No, there's still the louder exhaust mode, which can be activated by something I've taken the liberty to call the 'get-out-of-my-way button'. It turns a stupidly loud exhaust note into a roar that will literally, as my name suggests, frighten everyone else off the road. 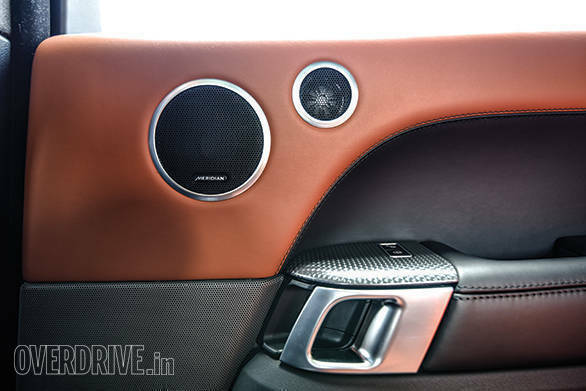 I'd say that that's a pretty nifty feature when you're driving around in a vehicle that costs over Rs 2 crore. Quite simply put, the SVR wins our tunnel test for the best sounding exhaust. There's nothing sportscar like about the Range Rover SVR though. It's got the body and soul of an SUV and the heart of a muscle car. 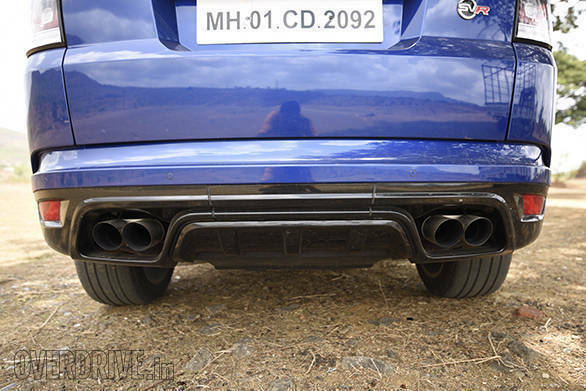 Essentially, this is a performance SUV that is as capable of hitting over 200kmph on the blacktop as it is crawling over large rocks off the road. It features Land Rover's Terrain Response system which offers four modes - Rock Crawl, Grass, Gravel and Snow, and Mud and Ruts and Sand. 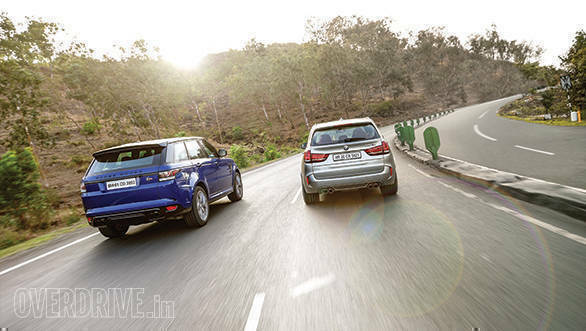 For on-road driving, however, it gets just two - a general programme and a Dynamic mode - which limits the SVR in terms of on-road performance. The general programme softens up the suspension a bit, shifts up earlier and reduces throttle response, while the Dynamic mode does the exact opposite - late shifts, sharp throttle and stiff suspension. The X5 M meanwhile gets three driving modes each for the engine, steering and suspension - Efficient (for the engine)/Comfort, Sport and Sport Plus. In Efficient/Comfort, the X5 M loosens up its shoulders, relaxes a bit and allows you to cruise calmly as the gears change up earlier, the suspension softens a little and the steering lightens. However, it doesn't fail to remind you that there's a big V8 sitting in front of you, with its constant but unintrusive rumble. In Sport mode, the entire car livens up a bit; in Sport Plus, the hounds are let loose. Of course, you can always mix and match these settings. For example, if you want all-out performance from the engine but not a back-breaking ride, you can pick Sport Plus for the engine and transmission and Comfort mode for the Suspension. 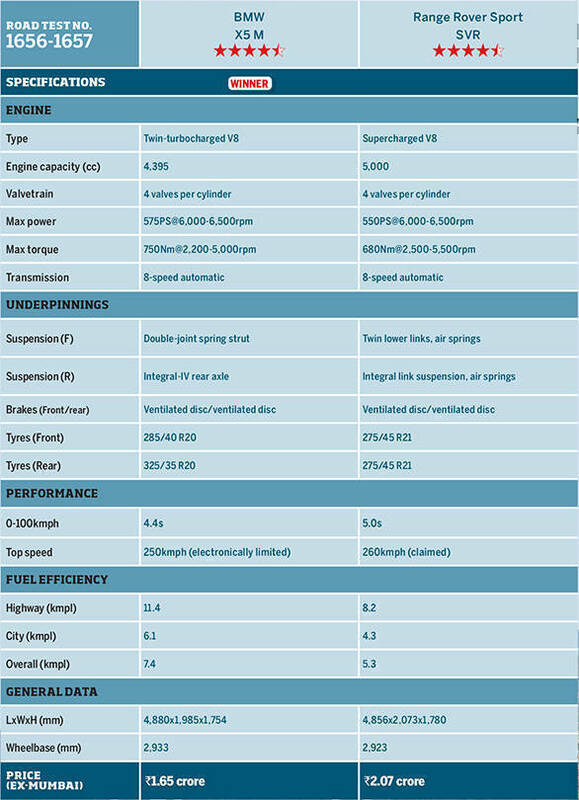 Since the SVR loses out on this, it is less adaptable to different driving conditions. 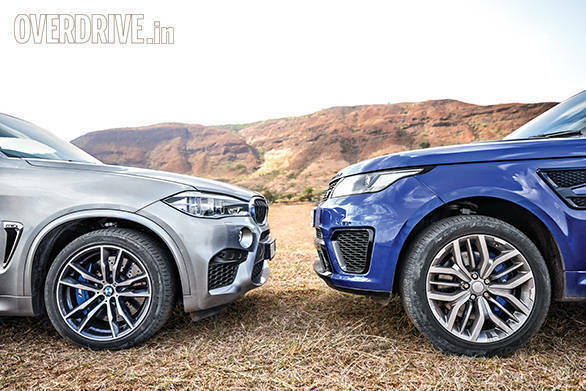 The X5 M is also the more effortless car to drive, while the SVR is more involving. In the Beemer, I can keep the SVR on its toes all day long and walk away without even having broken a sweat. In the SVR, however, I would be a bit more tired, but a lot happier. The tiredness comes from the concentration put into driving a big SUV at very high speeds, despite the joy that comes from that loud monstrous exhaust note and a steering that offers more feedback. The X5 M meanwhile is more encouraging and wants to be pushed faster and faster around the corners. 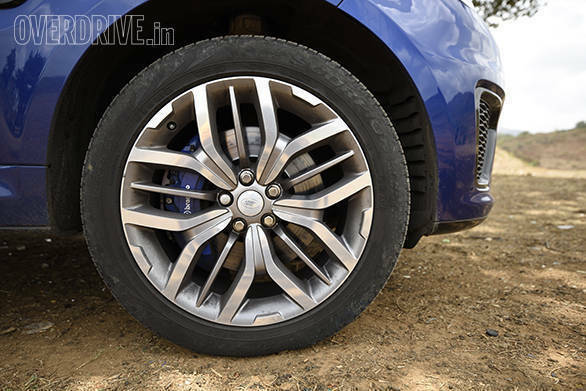 The SVR's 275 section tyres do tend to struggle for grip when you push them too hard around a bend. However, the X5 M's 285 and 325 section tyres in the front and rear stick like glue no matter what. Off the road though, it's a whole different matter. 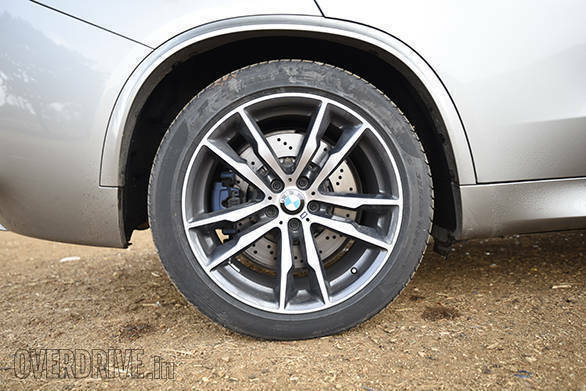 While the SVR will do almost anything, you would expect from an SUV, the X5 M barely wants to get its tyres dirty. 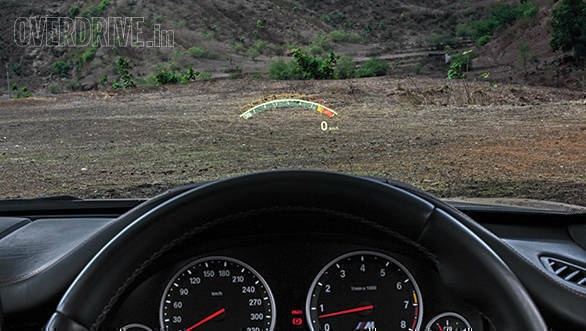 BMW has developed this vehicle specifically for high performance on the road. In fact, with 195mm of ground clearance, it sits even lower than the S60 Cross Country, and Volvo isn't even calling that an SUV. The SVR meanwhile has height-adjustable suspension with three height settings, the four off-roads modes mentioned earlier, all-weather tyres and a low-range setting. Another aspect where the Range Rover scores higher is road presence. When Halley and I were driving these cars around, all eyes were immediately drawn to the SVR while the X5 M mostly went ignored. 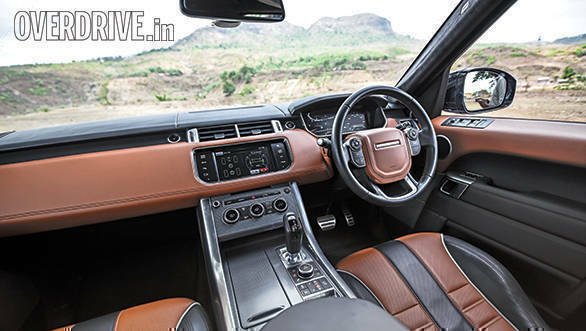 Range Rover Sports are a rare sight as it is and hence can turn quite a few heads. In an SVR, you can be sure of having a couple of people turn and follow you around for a bit, even if it's just to listen to that exhaust note. The blacked-out grilles and badging, the Special Vehicle Operations badge and large 21-inch wheels give it a very imposing presence that simply can't be missed even from a distance. The Beemer, however, like most M cars, is comparatively understated. But that is mostly because the X5 is one of the best-selling SUVs for BMW in India, and the M Sport package offered, which it can be optioned with, dilutes the exclusivity of the X5 M. It would take more than just a passing glance to recognise the larger wheels, the more detailed bumpers, aerodynamic wing mirrors, quad exhausts and the kidney grille with twin slats. That said, if you're the kind of person who likes to lay low, the Beemer should be just right. All through the day, I was having so much fun with these two cars that I completely forgot that I had to pick a winner. It was quite a tough choice because these vehicles have very different characters. 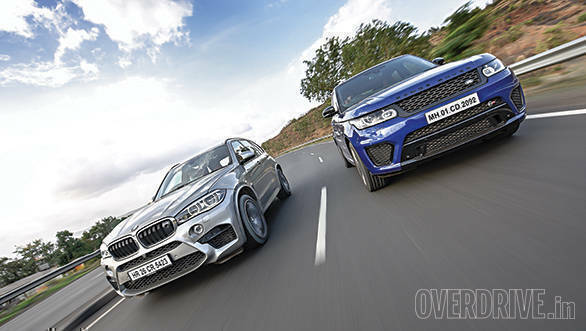 While one is a quick, smooth and tamed sportscar, the other is a wild, violent beast of an SUV. 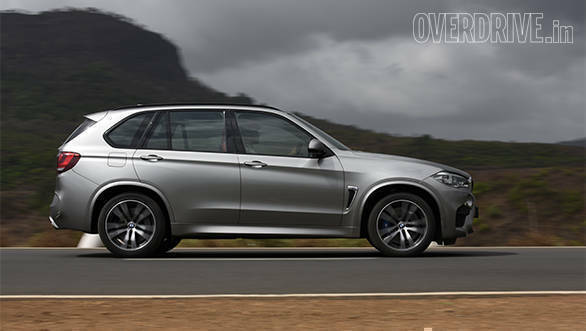 The X5 M is meant to be uncompromisingly quick and capable on tarmac, and it does its job superbly well. 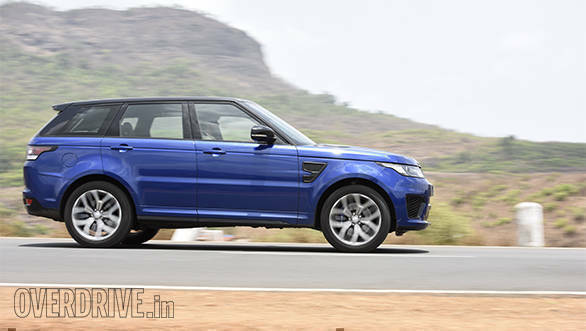 The SVR meanwhile is very capable on the road and can also go off the beaten track every now and then without hesitation. So then that would be the obvious pick here, right? To understand why, you have to understand the type of people who are looking to buy a performance SUV. Firstly, they are likely to have owned, or still own, a supercar or a sportscar and understand how impractical they are for everyday use. Next, they know what it's like to be bullied around by the bigger vehicles, so they demand presence. Finally, they want a vehicle that solves the first two problems without having to compromise even a bit on performance. Keeping that in mind, the Beemer offers a better overall package at a significantly lower price. 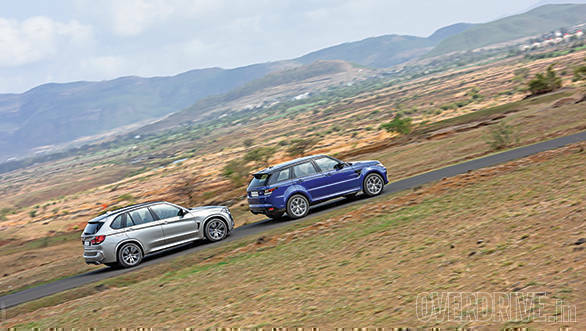 Being a better performer, it also makes an effort to be a bit more efficient with its auto start-stop system and Efficient driving mode, while the SVR clearly doesn't give a hootin' hell. Of course, like the SVR, a person buying it wouldn't give a hootin' hell about how expensive it is to drive. But what will be a concern is how often they'll have to visit the fuel station. While the SVR is at an advantage with its off-road capabilities, one must remember that off-roading is usually not the primary concern for these customers. They want a car that will double as a daily driver in and out of town with no hassles and makes supercars wet their pants when the occasion calls for it. In that respect, the X5 M makes the most sense. But with that said, I'd still like one more go in the SVR at a long tunnel, please.